"A 'truth' detached and purified of pleasures of ordinary life is not worth a damn in my view. Every grand theory and noble sentiment ought to be first tested in the kitchen—and then in bed, of course." Born in 1938 in Belgrade, Yugoslavia, Charles Simic spent his childhood in the war-torn Yugoslavia, emigrating to the United States with his mother at the age of 15. He finished high school in Chicago, then moved to New York City. When asked about his early adulthood in New York he said "As I recall, I was neither terribly happy nor terribly sad. One of the distinct advantages of growing up in [Yugoslavia,] where one is apt to find men hung from lampposts as one walks to school, is that it cuts down on grumbling about life as one grows older." This plain-faced ability to digest life as it is, both with humor and a lack of self-pity, marks much of Simic's work. A prolific writer, Simic has published more than 60 books and has received a number of prestigious honors. In 2007 alone he received the Wallace Stevens Award, and was appointed United States Poet Laureate, a post he still holds. 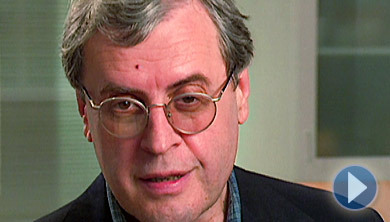 Charles Simic's reading is part of the WGBH series POETRY BREAKS created by Leita Luchetti. "Stone" from What the Grass Says by Charles Simic. Used by permission of George Braziller, Inc.
To read this and other poems by Charles Simic, as well as biographical information about the poet, please visit the Poetry Foundation Web site.